The purpose of the D-4 zone is to promote high-density development of commercial and mixed uses in areas with a concentration of federal and infrastructure uses. The following Downtown Sub-Areas are found within the D-4 zone: Capitol Security, Pennsylvania Avenue, Massachusetts Avenue Corridor and Mt. Vernon Square, Mount Vernon Triangle, North Capitol Street Corridor, Independence Avenue. A building in the D-4 zone may generate or use credits in accordance with Subtitle I, Chapters 8 and 9, which explains the credit system relating to Transferable Development Rights (“TDR”) or Combined Lot Development (“CLD”) rights. A building with frontage on a designated primary or secondary street shall meet the design requirements on Subtitle I § 602. 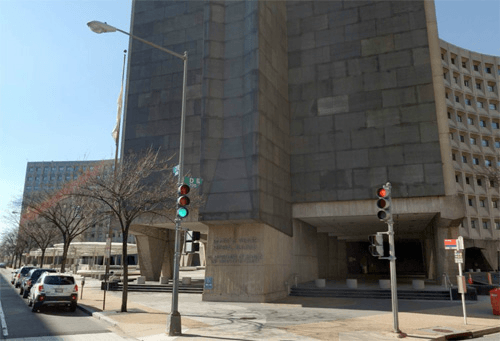 A building in he D-4 zone is not subject to front build-to regulations, unless it fronts on South Capitol Street or on a designated tertiary street segment. A front setback is not required, unless the building is otherwise regulated by the provisions for designated streets under Subtitle I §§ 616.7 and 618.5(b). 1 The maximum allowable FAR can be achieved: (a) If all FAR is residential and accesses the Inclusionary Zoning bonus; (b) If all FAR exceeding the non-residential density permitted in Subtitle I § 524.4 is residential and accesses the Inclusionary Zoning bonus; or (c) If conditions (a) or (b) are not satisfied through the use of credits pursuant to Subtitle I, Chapters 8 and 9. 2 If a building in the D-4 zone fronts on a designated tertiary street segment, or if the Zoning Commission, pursuant Subtitle I, Chapter 7, permits the building’s height to exceed 90 ft., the building shall be subject to the regulations of Subtitle I, § 525.2. 4Unless modified in in Subtitle I, Chapter 3 or by regulations governing a specific Downtown sub-area.